Who invented the Air Conditioner? The name of the person credited with inventing the Air Conditioner is Willis Carrier (1876 - 1950). Willis Carrier is not only famous as the American inventor of the Air Conditioner but also as a talented engineer. When was the Air Conditioner invented? Willis Carrier invented the Air Conditioner in 1902, during the Second US Industrial Revolution / Victorian period of invention (1850 - 1914). The invention of the Air Conditioner originated in America and is considered a principal achievement to the field of Household Items and Construction. Definition of the Air Conditioner: The Air Conditioner is defined as an apparatus and cooling system that keeps air cool and dry. An air conditioner controls the humidity and temperature of the air providing comfortable living conditions and improving industrial methods, products and processes. Fact 1: Who invented the Air Conditioner? The Air Conditioner was invented by Willis Carrier in 1902 during the Second US Industrial Revolution era of inventions (1850 - 1914) which was a principal addition to advancements made in the area of Household Items / Construction. Fact 2: Who invented the Air Conditioner? The story of the Air Conditioner began in 1758 when Benjamin Franklin discovered that all liquids when evaporated have cooling effects. His discovery was major step towards the invention of cooling devices such as the air conditioner. Fact 3: Who invented the Air Conditioner? The story of the Air Conditioner continued in 1881 when President James Garfield was Charles Julius Guiteau. The desperate attempts to save the life of the President included artificially cooling the temperature of the sick room with a "cooling system" device. Fact 4: Who invented the Air Conditioner - The Gorrie "Cooling System Device" Naval engineers constructed a box-like structure based on a "cooling system" that had been invented in 1851 by a physician and scientist called John Gorrie (1803 - 1855). The box-like "cooling system" device contained clothes saturated with melted ice water with a fan that blew outside air through the box and into the sickroom. The device was able to lower the room temperature by 20 degrees Fahrenheit. The "cooling system" device was used for two months during which time it consumed half a million pounds of ice. This, and all other attempts to save President Garfield, failed and he died on on September 19, 1881, 11 weeks after being shot. Fact 5: Who invented the Air Conditioner? The Gorrie "Cooling System Device" was totally impractical for general use due to the amount of ice required. It would be another 30 years before and engineer called Willis Carrier invented the first modern air conditioning system. Fact 6: Who invented the Air Conditioner? 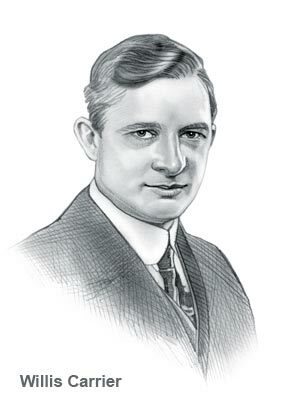 The inventor of the modern Air Conditioner, Willis Haviland Carrier, was born on November 26, 1876 in Angola, New York, United States and died on October 7, 1950. Fact 7: Who invented the Air Conditioner? The early years of Willis Carrier were spent in Angola, New York, United States where he was raised by his family. Willis Carrier was educated at Cornell University where he gained an engineering degree in 1901. Fact 8: Who invented the Air Conditioner? Following his education his first job was as an engineer at the Buffalo Forge Company, New York, in 1901. Fact 9: Who invented the Air Conditioner? The idea that led to invention of the Air Conditioner came to Willis Carrier when he was sitting on a foggy Pittsburgh train platform in 1902. As he was peering through the mist he suddenly realized that he could artificially create dry air by passing it through water. The ability to do this would make it possible to manufacture air with specific amounts of moisture in it. Fact 10: Who invented the Air Conditioner? Willis Carrier worked on his idea to control the humidity and temperature of the air and, in 1902, submitted drawings for what would become recognized as the world's first modern airconditioning system (AC). Fact 11: Who invented the Air Conditioner? In 1906 Willis Carrier patented his invention describing it as an "Apparatus for Treating Air." Fact 12: Who invented the Air Conditioner? In the same year, 1906, Stuart Cramer, an American engineer and contractor, discovered a ventilating device which provided water vapor to the air of textile plants. The action allowed yarn to be spinned easily. It was Stuart Cramer who named this process "air conditioning". Fact 13: Who invented the Air Conditioner? Realizing the potential of his invention of the "Air Conditioner" device, Willis Carrier left the Buffalo Forge company in 1915 to form his own company he called Carrier Engineering Corporation for manufacturing and distributing heating, ventilating and airconditioning (HVAC) systems. Fact 14: Who invented the Air Conditioner? Carrier Engineering Corporation installed the first air conditioning in a mansion in Minneapolis. Interest in the new invention of the Air Conditioner rapidly increased and in 1920 the company purchased their first factory in Newark, New Jersey. Fact 15: Who invented the Air Conditioner? In 1922 the first air conditioned movie theatre, Grauman's Metropolitan Theatre, opened in Los Angeles. The US Senate became air conditioned in 1929 and the White House had airconditioning (AC) installed in 1930. Fact 16: Who invented the Air Conditioner? The invention of the Air Conditioner by Willis Carrier was a massive success. In 1940 Packard Motor Car Company became the first car company to offer airconditioning (AC) as an option. Fact 16: Who invented the Air Conditioner? Willis Carrier's “Igloo of Tomorrow” opened in the 1939 New York World's Fair providing visitors with a glimpse into the future of airconditioning (AC) but before it became popular, WW2 broke out. Fact 17: Who invented the Air Conditioner? In 1946 following WW2, the demand for room air-conditioners began to increase and 30,000 room airconditioning units were produced that year. Fact 19: Who invented the Air Conditioner? Willis Carrier died on October 7, 1950 and buried in Forest Lawn Cemetery in Buffalo, New York. Fact 20 - Impact: The invention of the Airconditioning unit enabled us to enjoy comfortable living conditions with air conditioning units that are able to control temperature, control circulation and ventilation, control humidity and to cleanse the air.